When we were preparing the floor for refinishing, I knew we were going to have a hard time getting such a dark stain to go down evenly on the light oak floors. So, I did a little experiment with a technique called 'popping the grain'. 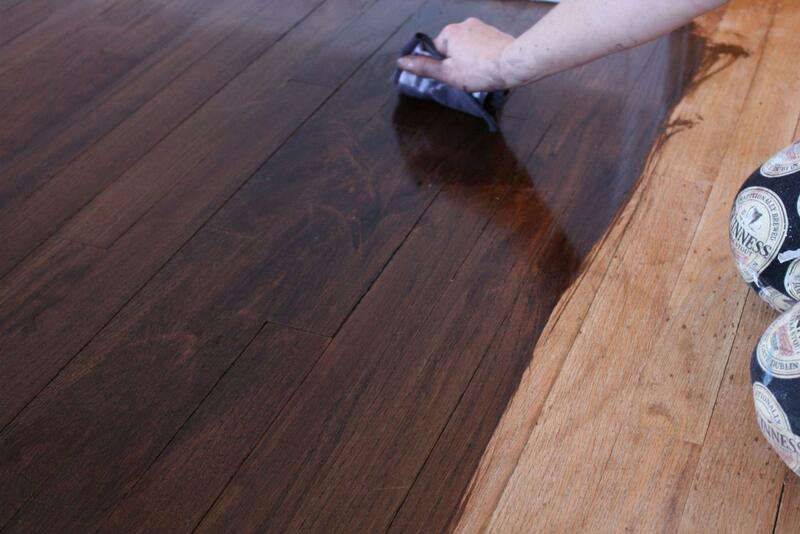 It involves evenly wiping down a newly sanded floor with a damp rag and letting it dry fully before staining. It opens the wood grain to allow the stain to more deeply penetrate the wood. To test the theory, I bought myself a cheap pine board from Home Depot's scrap pile. I sanded it well and taped it down the middle, using a damp rag on the right side only. This color is amazing. Until this came out, so many online message boards were filled with people trying to 'create' an espresso stain. People were mixing minwax Jacobean and Walnut, Ebony and Jacobean, etc. This is one-stop shopping for the perfect shade. Just don't be scared that it looks BLACK on the rag! The water-popping really worked well to help the stain absorb more fully. And this is just soft pine, so I knew it would look even better on our oak floors. Here is Shaun 'popping' the floor, his drawers were also doing a bit of 'popping', so you can thank me for not showing that angle! And then I would come in afterwards and smooth everything out with the grain. Until the entire first coat was complete. We weren't happy with the first coat, though. Because of the age of the wood and various water issues, we had quite a bit of splotchiness. Resanding those areas wasn't ideal, but it helped to eliminate that tiger-striped look. After the second coat, things were looking better. Because a second coat of stain doesn't absorb as easily as the first, we waited a full 48 hours to walk on it or apply the poly. Many experts say that you should never do a second coat of stain, because the wood has already absorbed as much as it can. However, if you allow enough drying time, you can successfully apply a second coat. Next week I will share the 'poly' and 'after' pictures! Great tip for fixing the areas that would take stain well! They are looking good! The floors look FANTASTIC! I can't wait to see the finished photos! So far they look great, I bet the finished photos are fabulous! Looking good!! The floors look amazing, I can't wait to do ours and really appreciate all your tips! They are looking good already, but it sure seems like a lot of work. I'm not looking forward to the day when we start our sand and re-stain project. Wow, those floors are gorgeous! So question. Lee has always loved very dark, rich floors. But my mom tells us over and over again that very dark hardwoods show every little speck of dirt. Have you found that to be true? We'd love to have espresso floors like yours someday, but I'm curious about how high maintenance they are. P.S. - You're so smart! Popping the floors was genius!! What a difference the popping made! The floors are looking awesome. I can't wait to see your after photos! PRETTY! Lovin' that dark stain. Gorg. Meg, your mom is right...dark floors show more dust than medium-toned floors. But I'm not one to love 'concealed' dust hanging around, so my twice-weekly mopping with Bona takes care of the problem. I don't mind them being a little high-maintenance! I can always count on learning something new from your posts... popping (floors and drawers) does not sound fun, but holy crap your floors look amazing!! I admire your patience - the popping and staining the floors is more than my short attention span can handle! Wow that color adds so much sophistication to your home. They turned out just beautifully. They're looking so good!! Dark floors add so much to a house. Can't wait to see the final "afters." very nice work. I look forward to seeing the finished pictures. That water popping demo was kind of amazing.....who would have thought it would have made THAT MUCH of a difference? wow... just wow! Totally worth the zombie manicure. Pop it like it's hot gurrrl! Wow great job!! Nice to see the step by step! I love dark floors and yours are looking great! Can't wait to see the after pictures. What a cool technique! And that is the perfect color without mixing. Definitely an amazing find. You guys put in so much work and it will be so worth it which is easy for me to say! Hi! A friend just sent me to your blog because I'm working on my own floors, and needed a push toward going darker with the stain. These look great! Thank you for being so detailed with your tips too!! floors look great. What grit paper did you use to sand your floors?